Watch the complete LIVE Walk of Fame star ceremony below. 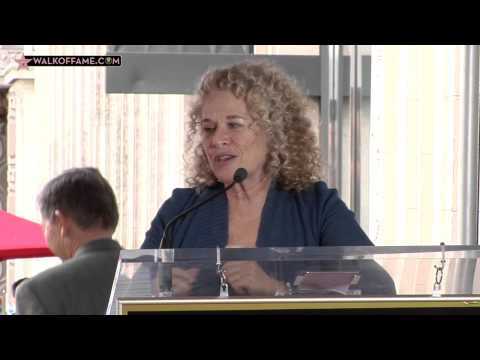 The Hollywood Chamber of Commerce honored the legendary Carole King, one of the music world’s most prolific songwriters, with star on the Hollywood Walk of Fame at 6906 Hollywood Boulevard across the street from The Dolby Theatre. “Carole has written numerous songs that are ingrained in the hearts of many and conger up great memories of times past,” said Leron Gubler, Hollywood Chamber of Commerce President and CEO. Gubler and celebrity guests Kristin Chenoweth and Lou Adler helped King unveil the 2,486th Star on the Hollywood Walk of Fame in the Category of Recording on December 3, 2012. Singer, songwriter, Carole King was born on February 9, 1942 in Manhattan and raised in Brooklyn. King's amazing musical gift was apparent from the time she was a toddler. Already an accomplished pianist by the time she turned 10, King began writing a multitude of songs by her early teens. She wrote her first #1 hit at the tender age of 17, penning “Will You Love Me Tomorrow” for the Shirelles with then-husband Gerry Goffin. The dozens of chart hits Goffin and King wrote during this period have become part of music legend, but it was 1971’s Tapestry that took King to the pinnacle. It spoke personally to every one of her contemporaries and provided the spiritual musical backdrop to the decade. While King was in the studio recording Tapestry, James Taylor recorded King’s “You’ve Got a Friend,” taking the song all the way to #1. In a first for a female writer/artist, Tapestry won all three of the key Grammy Awards—record, song and album of the year—as well as best female vocalist honors for King. With more than 25 million units sold, Tapestry remained the best-selling album by a female artist for a quarter century, and King went on to amass three other platinum and seven gold albums. King and Goffin were inducted into the Songwriters Hall of Fame in 1987 and honored with their Lifetime Achievement Award in 1988. They were also inducted into the Rock and Roll Hall of Fame in 1990 as songwriters and were honored by The National Academy of Recording Arts and Sciences in 2004 with the GRAMMY Trustees’ Award. King was nominated for an Emmy award in 2000 for “Song of Freedom”. She was awarded the Songwriter Hall of Fame Mercer Founder Award in 2002. In 2004 the Library of Congress named Tapestry to the National Recording Registry, which deems sound recordings to be culturally, historically, or aesthetically significant. At the end of the 20th Century, King was named one of the “100 Most Important Women in Rock” by VH1 and was included on virtually everyone’s list of the Most Important Artists / Women / Songs /and Albums of Rock and Roll. To date, more than 400 of her compositions have been recorded by more than 1,000 artists, resulting in 100 hit singles. She has won countless awards during her 50 + year career. Now 70 and still full of life, Carole King is, without question, the most successful and revered female songwriter in pop music history. In addition to her continuously-evolving musical career, King, who has lived on an Idaho ranch since the early ’80s, is actively involved with environmental organizations in support of forest wilderness preservation. *Carole King, Alicia Keys, Amy Grant, Herb Alpert, John Legend, Katy Perry, Lani Hall, Darlene Love, Jesse McCartney and Vince Gill will perform at a star-studded evening being billed as “You’ve Got a Friend…A Celebration of Carole King and Her Music” to benefit Paul Newman’s The Painted Turtle camp. The event is being co-hosted by Quincy Jones and Jack Nicholson. The magical evening of performances will be held at Los Angeles’ Dolby Theatre on December 4, 2012. Ticket sales for the evening, produced by Lou Adler and Kevin Duncan and sponsored by Clear Channel Media & Entertainment Los Angeles and iHeartRadio, are on sale now at www.dolbytheatre.com.